You might be sipping your pumpkin-spice latte as you read this or thinking about what Halloween candy to buy. While these are both perfectly appropriate fall activities, autumn is also the season to take stock of all that we do that is good and figure out a way to do more of it. Last month, Law360 published its annual roundup of the “BigLaw” firms that average 120 hours of pro bono legal service per attorney over a year’s time. (The full article is available here.) The publication of the list underscores the importance of pro bono work and a culture of doing good, and their impact on law firms, large or small. 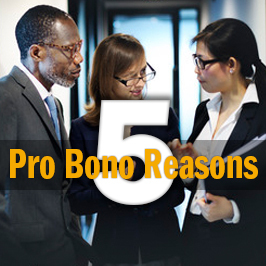 Here are some reasons why your firm should consider investing more time and energy into building its pro bono program. Pro bono work frequently affords attorneys to practice in an area of law that isn’t their usual focus. In partnering with a legal aid clinic, a firm receives a list of cases that need attorneys. A corporate litigator will work on a benefits case; an IP attorney will help someone with immigration status. Attorneys have the opportunity to brush up on law that they might not have considered since law school. Most find it rewarding, and sometimes even fun. Along with practicing in an area outside their day-to-day work, pro bono cases also give attorneys the opportunity to work with other lawyers in their firms whom they may not otherwise know. That creates relationships – and cross-firm opportunities in the future. It also helps attorneys build networks with other attorneys who are also working for legal aid foundations. That networking leads to business development, which also benefits the firm. When your firm is recruiting new attorneys, particularly from younger generations (see my colleague Sue Remley’s article on millennials here), those potential new members of the frequently ask about the firm’s commitment to pro bono. You want to have a somewhat active pro bono program if you are hoping to attract new talent in the next few years. While we are talking about younger talent, pro bono helps young lawyers gain experience and build their skill sets. Tapping into younger lawyers’ energy and desire to help others is a win-win. This may be the most important aspect of pro bono. I have worked with many attorneys at firms, varying in size from solo practitioners to AmLaw50, who say that helping others with their legal work makes them feel re-energized and re-committed to the law. Pro bono work frequently reminds attorneys that they are practicing law to help people. The energy frequently carries over into their regular practices as well. And their clients? Attorneys have the opportunity to make their clients feel empowered and hopeful in situations that they thought were dire and hopeless. How do you get started? It is usually as simple as a phone call to your bar association or local legal services agency. They know they are working with busy attorneys and have streamlined the process as much as possible to make it efficient and provide you with necessary tools to help you get started. If a commitment to pro bono is not possible for your law firm in the near future, consider making donations to legal aid foundations this year in lieu of sending traditional holiday gifts to your clients. It shows your clients that you appreciate them while also helping the underserved access legal counsel. To discuss how to make the most of your firm’s pro bono program, feel free to contact me, Stephanie Holtzman, at sholtzman@jaffepr.com. You also can leave a note below to share your most-fulfilling pro bono experience.